Megadeth frontman Dave Mustaine stirred up a major controversy this week thanks to his comments at a recent concert in Singapore, when he claimed that president Obama had staged the recent mass shootings in Aurora, CO, at the Dark Knight Rises premiere and in Oak Creek, WI, at a Sikh temple. Now, Mustaine has spoken out in an attempt to clarify his opinions. Mustaine called in to Infowars' Nightly News to talk about the uproar over his comments. Mustaine didn't apologize, and for the most part he stood his ground, but he did concede, "In the heat of the moment, when you're on stage and you're talking, sometimes you're not as eloquent as you'd like to be." 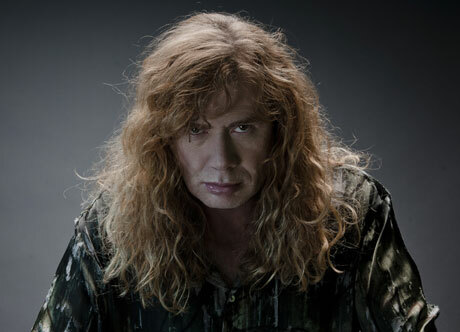 Much of the interview concerned the alleged Fast and Furious gunwalking scandal, as Mustaine claimed that he was simply reiterating the opinions of gun lobbyist Larry Pratt. The singer said, "Larry Pratt, the head of Gun Owners of America, who's a highly respected person, said that if they would stage Fast and Furious, they would be capable of staging anything. It was all done to blame the second amendment. We'd be fools not to look at this. Our U.S. Border Patrol agents were killed. Like I said, I was just quoting Larry Pratt. That's it, bottom line." Mustaine avoided making any more overt statements about the tragedies in Colorado and Wisconsin, but when show host Alex Jones drew a parallel between those events and Fast and Furious, the singer said explained his position like this: "There's some questions here. I just think we deserve to know the truth. That's it." He finished the interview by adding, "I'm a patriot. I love our country. I've always been controversial. I'm a political songwriter. This wasn't done to hurt any of my fellow countrymen. I think that it's something we really, really need to look into." At different points in the conversation, Jones attempts to absolve Mustaine's onstage comments as being "taken out of context" and "tongue-in-cheek." Judge for yourself by watching both the interview and the original concert footage below.